Having wet shoes is never fun. It’s even worse when you’re going to need to wear them long before they’ll actually be dry. Thankfully now you can have these cute little pups to dry them out again. They’d work great for those of you that have to go for a decent sized walk just to get to work every day. For days when it’s raining you could keep these dryers in your desk and with these around, in no time your feet will be warm and dry again. 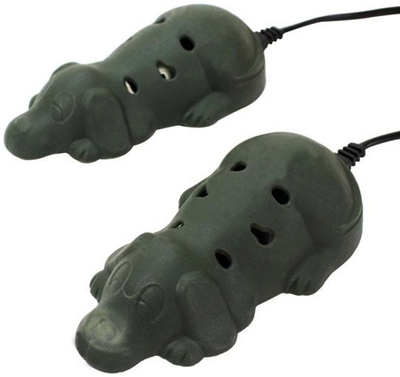 These USB puppies get their power from exactly where you might guess. Just plug them into your USB port and put one pup in each shoe. It’s all pretty basic. I’m not sure how powerful they are, but if nothing else they will help out the situation. In order to pick up the pair of these it’ll cost you ¥2,800.00 or right around $31 through Geek Stuff 4U.